Hellermann Tyton cable ties are available in a wide range of materials - these cable ties all feature internalserrations allowing for a positive hold onto cable, hose and pipe bundles. The design of Hellermann Tyton cable tie heads guarantee a high tensile strength whilst allowing a very low insertion force and ensuring a simple and quick installation of LV-HV cables. 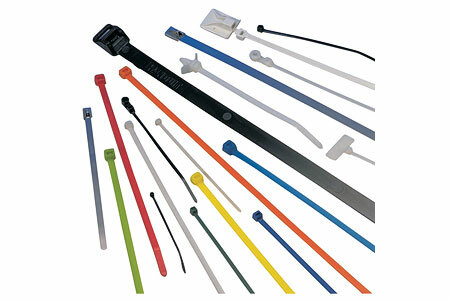 Hellermann Tyton manufacture a full line of high quality cable ties in a variety of styles, sizes, materials, and colours. Used to bundle and secure wire and cable, Hellermann Tyton cable ties are engineered and manufactured for maximum performance and quality. Whilst easily installed by hand, manual and pneumatic (for high volume applications) tensioning tools are available to ensure a consistent and safe installation of Hellermann Tyton cable ties. * Standard Hellermann Tyton cable ties include : Polyamide 6.6 Cable Ties, Releasable Cable Ties, Double Headed Cable Ties, Heavy Duty Cable Ties, Clamp Ties, Wide Strap Cable Ties and UV Heat Stabilised Cable Ties. * Specialist Hellermann Tyton cable ties include : PEEK cable ties, Speedy Ties, Metal Content Ties (MCT), EL-TY Continuous Cable Ties, TAS Aerial Support Ties, CTF Cable Tray Ties and Specialist Application Cable Ties with LSF, extreme temperature and chemical resistant performance. T&D distribute Hellermann Tyton Cable Tie Tools including the MK ranges of manual, pneumatic and automated cable tie installation tools. 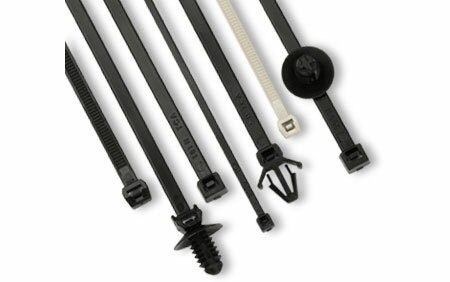 Hellermann Tyton offers many options of cable ties that will withstand 18 to 30 lbs of force. Whether the cable tie or clamping application demands mounting, releasable or identification features, HellermannTyton has the cable tie to suit the application. For cable bundles and clamps requiring 60 to 250 lbs of tensile strength. The wide strap cable tie strap minimizes pinching on soft bundles (soft rubber sheathed cables) and features a low profile head to provide compact bundling. Hellermann Tyton outside serrated cable ties are for applications where thin walled or soft insulation is used (aircraft, trains, etc.) and for applications that are very sensitive to the amount of force applied to the cable. Hellermann Tyton releasable cable ties ideal for use in cable applications where there is the need to repeatedly open and close the cable ties. Hellermann Tyton clamp ties have triangular shaped tabs extending beneath the head, allowing for optimal surface contact and complete circumferential compression to 360 degrees. The cable clamps are recommended for soft rubber hose applications including fuel, water, and air vacuum lines. Double head ties can be used for installation of a second parallel cable run without the need for additional cable ties - the cable ties second loop may also serve as a positioning device for a single bundle. Tie and identify bundles of cable or pipes in one operation - Hellermann Tyton identification cable ties have large flat areas for imprinting or labeling information. Hellermann Tyton stainless steel cable ties (grade 304 and 316) are designed to secure hoses, cables, poles and pipes in harsh environmental conditions. PEEK cable ties will withstand temperatures from -55° C up to +260° C - PEEK cable ties are chemical resistant, including resistant against acid and gamma radiation. Furthermore PEEK cable ties have good abrasion resistance. The branch cable tie is ideal for wire harness applications where wires “branch” away from the main assembly in a "Y" shaped intersection. Who Are Hellermann Tyton ? Solar Energy - Hellermann Tyton offers a comprehensive product portfolio for a secure cable routing and therefore failsafe connection in the solar industry. To ensure lasting and effective power output Hellermann Tyton develops cable ties to meet the enormous demands on solar energy systems like resistance to extreme weather conditions, extreme mechanical stress and higher-than-average durability. Wind Eenrgy - Hellermann Tyton cable ties for the wind energy sector are the optimal and sustainable protection from cold, dampness and dirt. Failsafe operation requires the highest product quality in terms of UV-stabilisation, resistance to heat and cold and fire protection and resistance to vibration. Rail - Hellermann Tyton develops innovative cable tie and clamping solutions made of high-quality raw materials - outstanding fire protection properties. Cable Ties - Terminology : Cable ties are also known as zip ties, wire ties, nylon ties, HVAC straps, A/C ties, duct strap, weather resistant cable ties, steel cable ties, stainless steel ties, plastic ties, weather resistant tie, outdoor tie, hook and loop tie, releaseable tie, heavy duty tie, heavy duty cable tie, flag tie, marker tie, flame retardant cable tie, cable flag tie, tie market, tie flag, self locking cable tie, stay straps, tie wrap, miniature cable tie, flourescent tie, plenum rated tie, barb tie, steel barb tie, lashing tie, clamp tie, or tie clamps - T&D UK distribute market leading cable ties manufactured by Band-It, Hellermann Tyton, Panduit and Thomas & Betts.